With our prime vision to offer optimum quality products to clients in a stipulated time period, we have become a preferred choice of our valued clients. 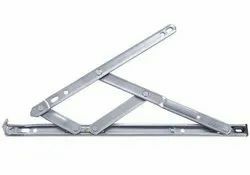 Our range of Hinges has gained immense popularity among our wide spread clientele. Our range includes SS friction hinges and friction hinges. Some salient features of our products are rugged construction, dimensionally accurate, proper deflections, standardized finishes, customized designs, easy to install and the likes. From our establishment itself, quality has been the core base of our all business activities and we implement prevailing quality guidelines. Casement Keeper is used in door with casment espage for locking. Casement Keeper is made from zink.